Bonnie Krupa grew up in the Upper Peninsula of Michigan. She was active in 4-H and FFA and showed steers, hogs, sheep and chickens at the state fair. Bonnie also had a love of companion animals and often had numerous cats and dogs growing up. Bonnie has been training dogs since 2003. She currently owns three adopted dogs (Ginger)- 9 year old German Shepherd, (Sheba)-13 year old cattle dog/terrier mix and her newest addition (Rusty)-1 yr old Golden Retriever. She also has three rescued cats, Lefty, a 1 yr old kitty who was found soaking wet and injured last year, Mr. Branch, who was found in a tree in our yard and we had to contact the fire department to rescue him, and last but not least, Pumpkin, who wandered into our yard and his owners were never found. She lost her lab of 15 years (Sandy) and her FIV Kitty of 18 years (Jinx) in 2018 and her 2 Golden Retrievers (Ranger (14) and Shelby (6) ) in 2016. Certified Kennel Operator (CKO) from the Pet Care Services Association (PCSA). Certified Trick Dog Instructor (CDTI) from Kyra Sundance’s Do More with Your Dog Program. Perception Modification certification from Kayce Cover and attended 2 Training Between the Ears seminars with Mark McCabe. Bonnie is an approved evaluator for the Canine Good Citizen designation through the American Kennel Club (AKC), AKC Star Puppy Program and an evaluator for Therapy Dog International (TDI). Bonnie trained doges though the CHANCE program, which she developed at the New Castle Correctional Facility. CHANCE stands for: Canine Handlers Achieving a New Career Education. Dogs from the New Castle Animal Shelter were paired up with inmates at the correctional facility and trained for 12 weeks then they were adopted out to the public. The program began in June of 2005 and lasted for 3 years. In that time they adopted out over 30 dogs. Bonnie enjoys participating in community service activities such as Bark for Life and White River Clean up, is active in Women and Business Unlimited (WIBU), Community Business Connections (CBC) and EmComm ECI (a ham radio organization-her call sign is KC9EMV). In her spare time she enjoys reading mysteries, hallmark movies and playing with her dogs and teaching them tricks, obedience and agility. Bonnie is a balanced trainer and works with owners to teach them how to listen to their dogs and also to earn their respect. Communication travels both ways on the leash. Her goal is to incorporate fun, enjoyment, patience, love, guidance, and respect into training in addition to exercise, boundaries and affection. She also encourages owners to look at the whole dog including dog food ingredients, vet care, holistic care such as acupuncture, massage, and chiropractic needs in addition to essential oils and supplements. 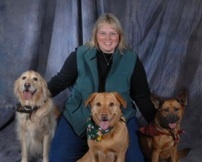 She uses her expertise and knowledge to evaluate each dog and owner and offer the best solution to address the problems. She is open to all training aids available including clickers, treats, toys, harnesses, halti’s, slip leads, prong collars, and remote collars. She attends national conferences, workshops, and presentations in order to learn a variety of training techniques and methods available. Bonnie has also been acknowledged and published in the book called, Top Tips by Top Trainers.